Discussion in 'Football Forum' started by Varun, Aug 31, 2017. Given the number seven jersey. I think he'll be terrific for them, it's great news for England aswell. Hmm, interesting. He actually chose a foreign club. Never heard of him. 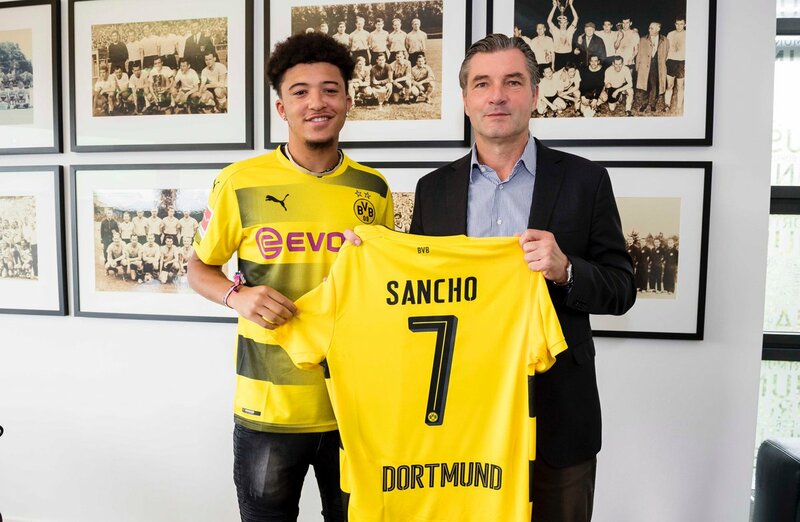 Nice to see a young player without a silly double barreled name though, good luck to him as you don't see transfers going this way round often. Marvellous business by Dortmund. Wonder how much they'll get for him before he turns 20. If he proves to be a top player in the future we should go for him. We have to try and bag the best British talent. Will now give me a reason to follow Dortmund somewhat closely this season. He'll be very expensive to bring back to England in a few seasons if he keeps working hard and stays injury free. Dortmund are a brilliantly run club. Actually give the youngsters a chance at the highest level and fleece the rich clubs all while playing good football season after season. Super sustainable model. There are loads of bargains out there. Smart kid, even if it doesnt work. I know but it's hardly something to moan about. It's their family name for Christ sake! We'll try but it'll probably be in vain, the whole reason why he left City in the first place is supposedly because he had problems/didn't like Manchester IIRC. Ah you know, Fosu-Mensah, Trent-Alexander, Loftus-Cheek, Calvert-Lewin, Walker-Peters and so on and so forth. Seems like every club in the prem has one. Yeah, it is a bit weird. Yup, Ox and TTA for us. I think there's one in the academy as well. Shirt letter sales people must love Liverpool ATM. I wouldn't get my hopes up. Given his age I reckon he's going to play for the u20 or second team for the time being. He will probably go through the winter pre season with the senior squad and get some minutes in friendlies that will determine the opportunities he's going to get in the second half of the season. Dortmund have Philipp, Pulisic, Schürrle, Yarmolenko and after the winter break Reus as well on the wings, they aren't relying on him at all this season and whatever minutes he might get will likely be little rewards here and there if he does well in the youth team and training. And...? Why is it a problem? He already mentioned, shirt letter sales people are getting unnecessarily rich. Or he was just jesting a bit. I remember some spurs fans getting giddy over signing him the other week. Well, one spurs fan in particular. I wonder how many alerts Glaston will see the next time logs onto the caf. Pretty sure that smug Glaston marked his return to the CAF after Spurs lost to Chelsea two days earlier. Won't be a top player. Will soon disappear. Hopefully gets a chance if he's being given number 7. Stephen Howson seems to think he's brilliant from listening to FullTimeDevils. Liverpool fan in racism shocker. And... Why is it your concern? Eh? What's race gotta do with silly double barreled names Sherlock? Please answer me that.